The day finally arrived for our first long distance walk, west to east on Hadrian’s Wall National Trail in England. Hadrian’s Wall, a UNESCO World Heritage Site, was built in 122 AD by Roman soldiers, under the orders of the Emperor Hadrian. 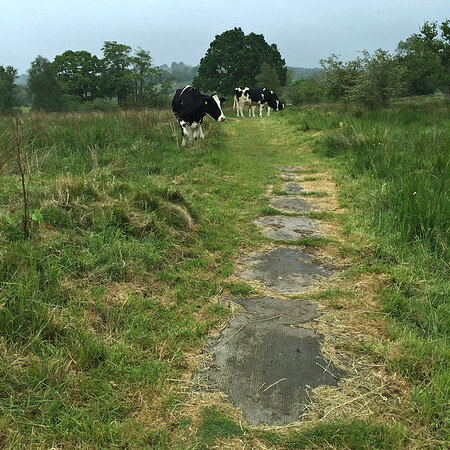 The path follows this stone wall across England from coast to coast, so we could say “we walked across England!” This path seemed doable for our first walk – but still a challenge. Most walk Hadrian’s Wall east to west, but our route was west to east, so we would have the prevailing winds at our back. According to my Hadrian’s Wall T-shirt, the trail is 136 km (84 miles), with 80 milecastles and six Roman forts. The actual length is probably a bit longer when you go off the path for accommodations, detours, food or fort visits. We decided to complete the walk in 6 days. 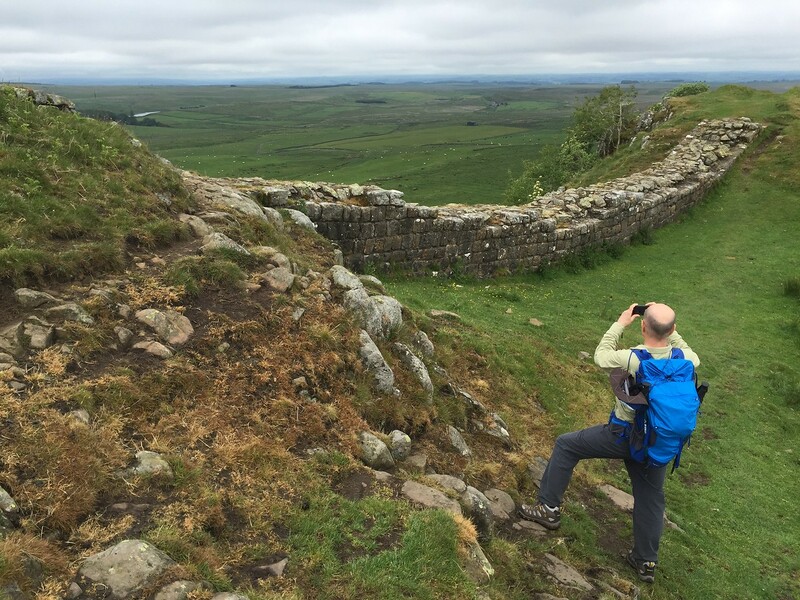 If you are planning your own Hadrian’s Wall walk, see below for more specific tips and resources, and info about our hiking gear. Here’s how our walk went! It was a perfect June morning to begin our walk, with blue sunny skies. We arrived in Carlisle a couple days earlier to have time to explore the city, and recover from jetlag. For the first section we had to take bus #93 to the path’s start at Bowness-on-Solway, then walk back to our Carlisle hotel for one more night. Bowness-on-Solway is a peaceful village on the Solway Firth. The cute homes here don’t have addresses, but names like Silver Hill, and the White House. We saw the well-known local pub, The Kings Arms, but it doesn’t open until 4pm, which is too late for most west to east walkers. 7040 miles from home. Across the firth is Scotland. The official start of Hadrian’s Wall Path is at a small shack along the Firth, which opens into the Irish Sea. At this point the firth is also the border between England and Scotland. The path begins fairly flat with a long stretch along the firth, and lots of birds. Early on this first section there was an interesting man who had made a road sign, which he updated for each walker to mark the distance to their hometown. On the first day, there was no actual wall to be seen…at least not in its original form. After the Romans left the wall was no longer in use, so people used stones from the wall for their own construction needs. An example of this is St Michael’s Church, in Burgh-by-Sands. This 12th century church was built on the foundation of a Roman Fort, with stones from the wall. In 1307 Edward I was brought here to lie in state after being killed during the uprising of Robert the Bruce. It is one of many churches and other attractions to see along the path. 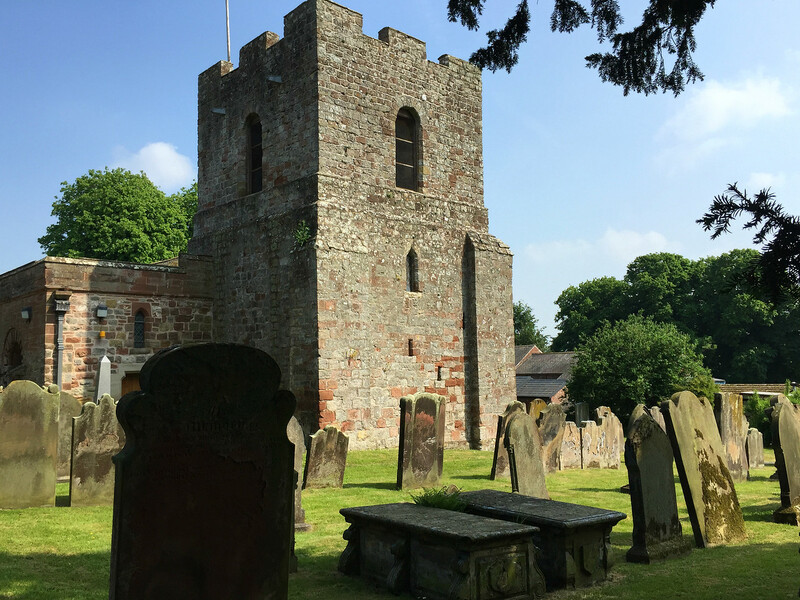 The 12th century St Michael’s Church, in Burgh-by-Sands, was built on the foundation of a Roman Fort, with stones from the wall. 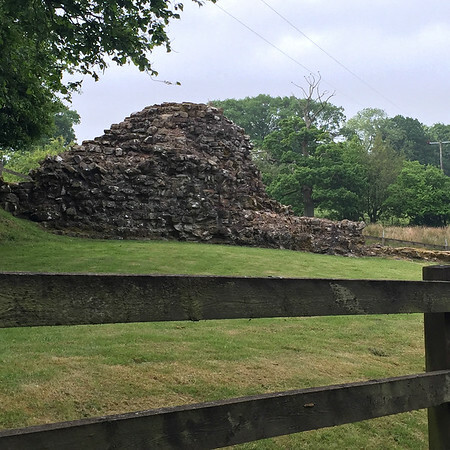 Although we didn’t see remains of the actual wall, there was a lot to make this part of the walk interesting, from listening to birds in the wetlands, cute villages, wooded areas and pastures. We saw a lot more cows and sheep along the path than people. Much of the path goes through private property, and there’s an amazing variety of ways to cross through gates or over walls. The acorn on the post is the symbol of Hadrian’s wall path. Walking into Carlisle we encountered a detour due to the devastating flood in early 2016. By the time we reached our hotel again we had walked 31 km, tired but happy to have completed our first leg. It’s worth spending a day in Carlisle to explore the small city and its castle. This morning we rejoined the path at the Eden Bridge, and for the first while the it followed the River Eden. 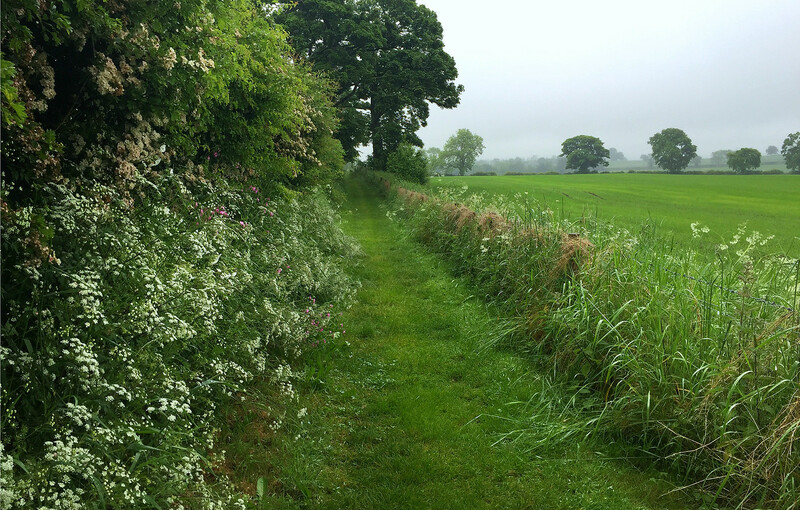 The path leaving Carlisle was beautiful, down a long aisle of spring flowers. Wildflowers along the path in June. The famous Stall-on-the-Wall honesty box. 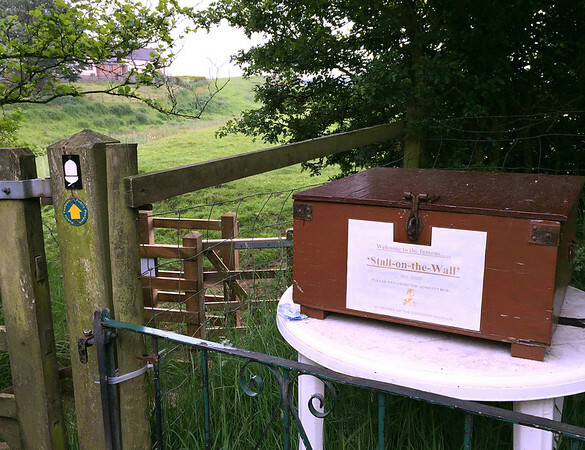 After a couple of hours, we came across the “famous Stall-on-the-Wall”, which is an honesty box filled with assorted chocolate bars, chips and other treats to maintain your strength during the walk. There are a few of these fun stations along Hadrian’s Path, so if you go bring some small change or bills to enjoy them. One even had a small freezer with ice cream bars. 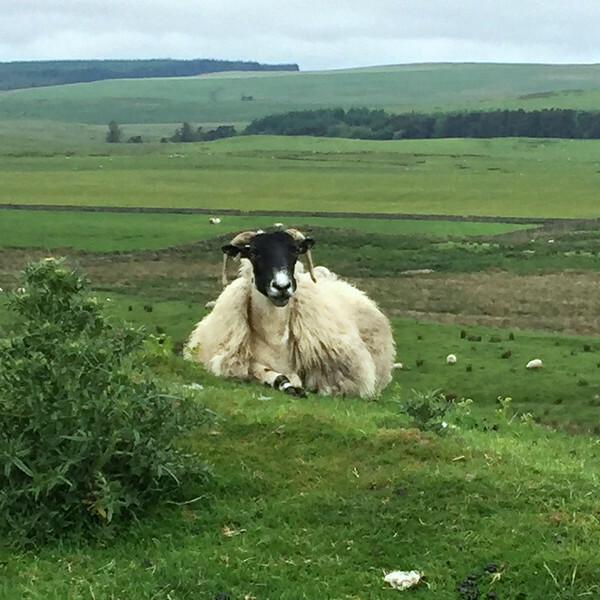 Much of Hadrian’s Wall path goes right through farmer’s fields, so we passed by lots of sheep, cattle and horses. We enjoyed seeing them, and most animals watched us with mild interest, but this cow right beside the path was a little intimidating. We went off the path to give it as much space as possible, and Darrell promised it he would cut back on beef. This cow was a little intimidating. After walking 20km we appreciated the comfy wood chips on this path. Quarryside B&B room with a view. 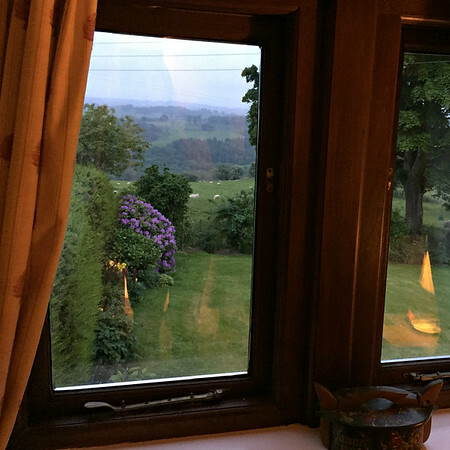 Our ensuite room at Quarryside was lovely and spacious with a view of the country. 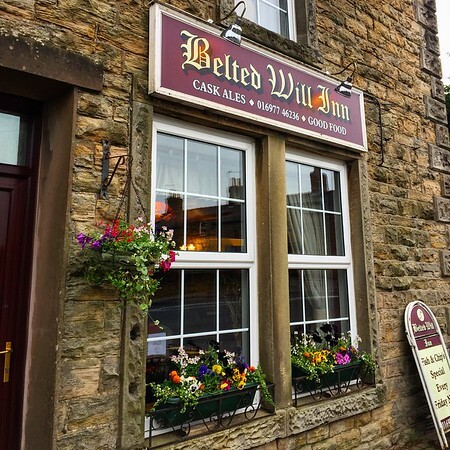 After a short rest, the Elizabeth’s husband drove us to the Belted Will Inn for a pub dinner. I had a tasty fish pie and Darrell had steak pie, in spite of his promise to the cows earlier that day. After our delicious dinner the pub owner gave us a ride back to our B&B. Day three started with an excellent breakfast at our B&B, including their own farm fresh eggs and local sausages. We also took Elizabeth up on her option of a packed lunch. Before setting out, I doctored my feet with Second Skin, Compeed, and duct tape. With them fully covered they didn’t feel too bad. The weather had become misty with some rain, but we were prepared with rain coats and covers for our backpacks. The cooler temperatures were pleasant to walk in so we didn’t mind at all. This section of the path is hilly, very picturesque, and we were seeing a lot more of the wall. 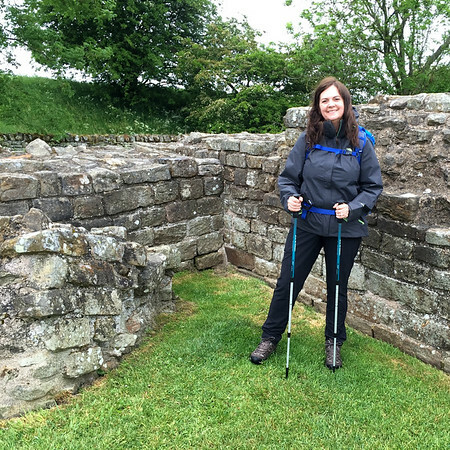 Ready to walk Hadrian’s Wall Path – rain or shine! A section of the trail through a quiet woods. Turret 49B. 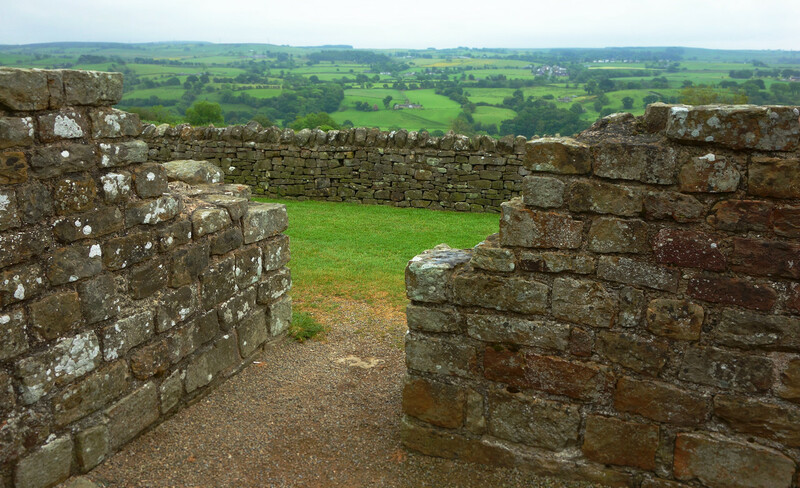 Two small watchtowers, or turrets, were built between each milecastle. Birdoswald, one of the best preserved Roman forts on Hadrian’s Wall. 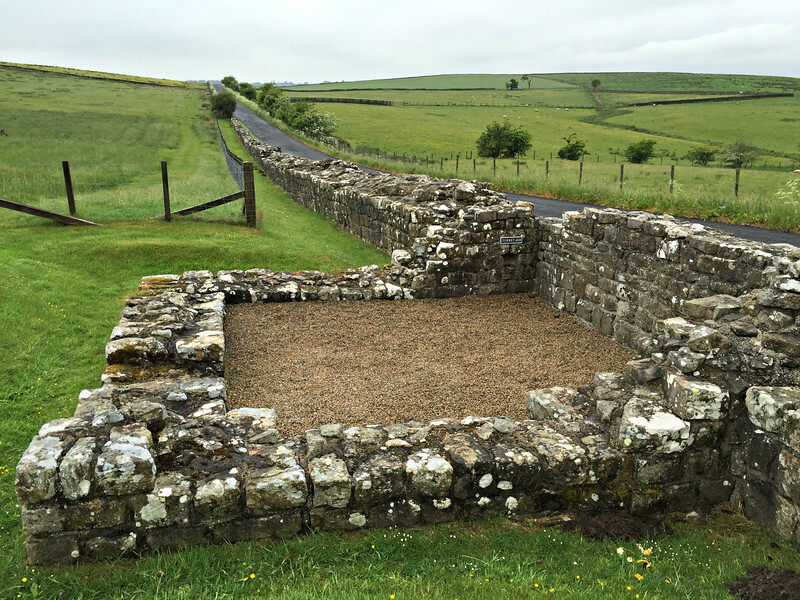 After about an hour, we reached Birdoswald, one of the best preserved Roman forts on the wall and well worth a stop. A short time later we arrived at these remains of the Roman Willowford Bridge, which originally crossed the River Irthing. Over time the course of the river changed so these remains are a distance apart from the current modern bridge. 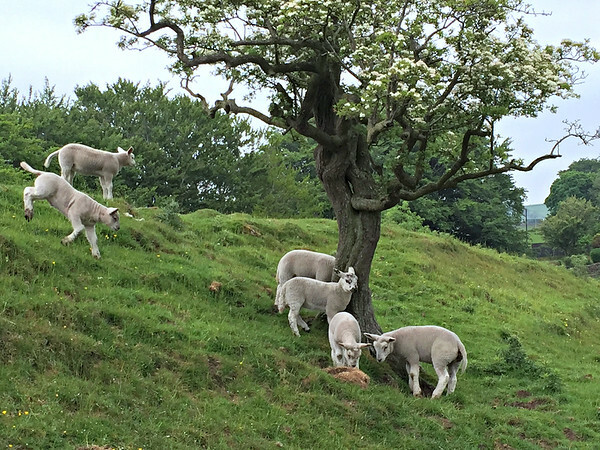 Some super-cute lambs frolicking on the hill. Despite the beautiful scenery, my feet could only make it about 14 km. While walking to a bus stop, a couple of local ladies in an SUV stopped to ask if we needed a ride. They had noticed me hobbling, and we gladly accepted their ride to our next B&B. At the Old Repeater Station we had a nice welcome from our host, Les. The room was a small ensuite with a comfortable bed and cozy bedding. There is also a comfortable common lounge and dining room. Les made a delicious dinner for us and his other guests, served family style at his big table. I had steak pie and Darrell had lasagne, served with bowls of mashed potatoes, vegetables and bread. After another hearty full English breakfast (and a few more packages of Compeed and Second Skin) we were ready for day four. 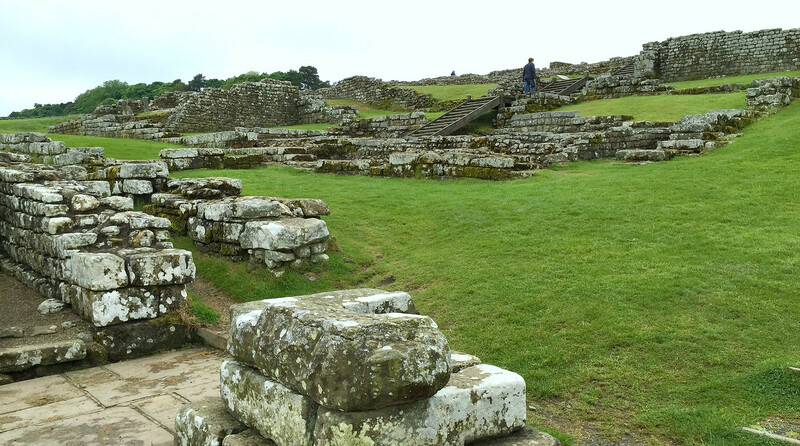 The previous day we had cut the walk short and missed some of the most spectacular sections, so we took a bus back a few miles to begin our day at Housesteads, the most complete Roman fort in Britain. We were glad to see the fort, and the dramatic landscape in this section was a highlight of our walk. The path follows the best preserved section of the wall up and down steep hills, with spectacular views. The ground here is steep and very uneven, but with our hiking boots and walking poles it was a pleasure. This was the busiest section of the path with a lot of day walkers, but not at all overly-crowded. Rugged terrain and spectacular views on day four. We were only able to make it 10 km, to Carrawburgh, Temple of Mithras, then I had to stop again because of my feet. 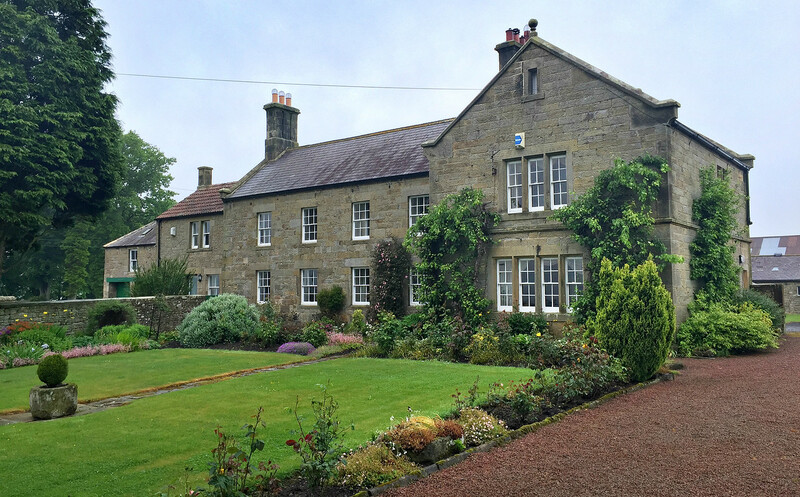 So we took a bus to Chollerford, then a taxi to our next B&B, Halton Red House Farm. At this point we changed our goal to walk at least 100 km of the trail. My disappointment at cutting short another day’s walk was soon forgotten when we arrived at Halton Red House Farm, another lovely B&B. Our hostess Sheila drove us to a nearby pub where we had another excellent, hearty meal. 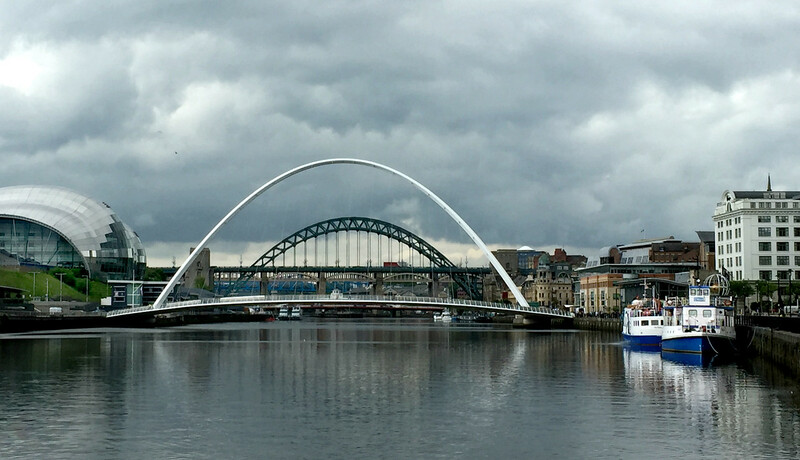 After a perfect English breakfast we set off again towards our next stop at Newcastle-upon-Tyne. On day five the rugged terrain was behind us, and the hills flattened to gently rolling farmland that looked beautiful even on this rainy day. A pleasant walk on a grass path. After about 5 km we came across the Robin Hood Inn, where we decided to stop in for an excellent scone with cream and jam. 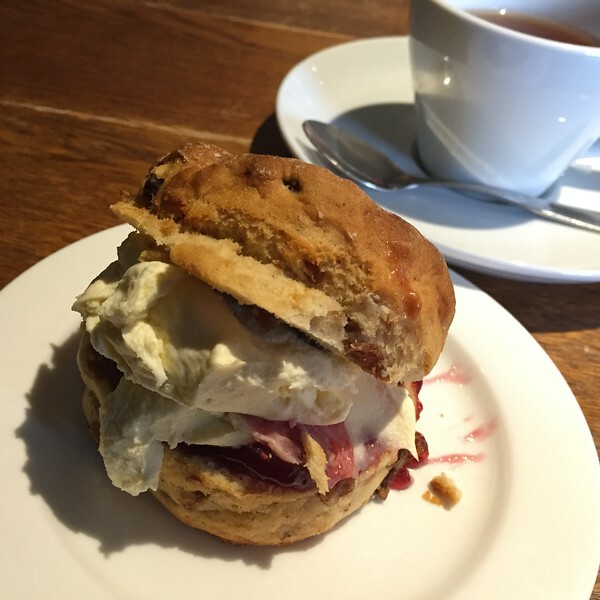 …where we had an excellent scone. We walked 17 km, then stopped at the Three Tuns pub at Heddon-on-the-Wall, then again because of my sad feet, took a taxi to our hotel in Newcastle. On our final day we hired an Uber driver to take us from Newcastle to Wallsend, which is the eastern terminus of Hadrian’s Wall path. We then walked west back to Newcastle. At Wallsend is the Segedunum Roman Fort and museum. We didn’t visit the museum, but we did go up their tower which looks over the former fort, and has a good video explaining the history of the site through the ages. Then we walked the 8 km back to Newcastle, which is a very nice urban path once you get past the first bit at Wallsend. Coming into the city the path follows the River Tyne, with Newcastle’s interesting buildings and bridges. 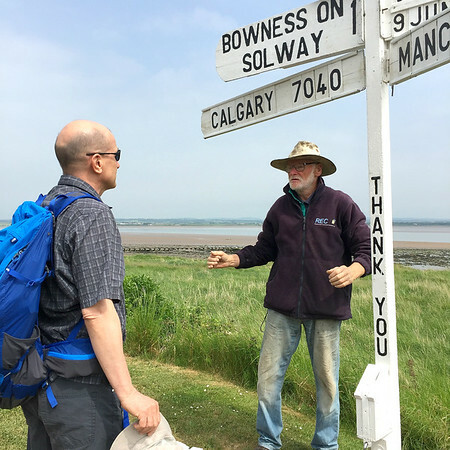 So in the end, we walked 107 km of Hadrian’s Wall path, coast to coast, but with 36km skipped across days 3 to 5. The only real discomfort was from blisters on my feet. In hindsight I think I caused this by having a pedicure a couple weeks before our walk, which may have made my feet look pretty, but also removed callouses that probably would have been a layer of protection for a long walk. Otherwise, we both felt good, and the hills even became easier as we went. It was a great experience as our first long distance walk, and I’m already thinking of where we could walk next. 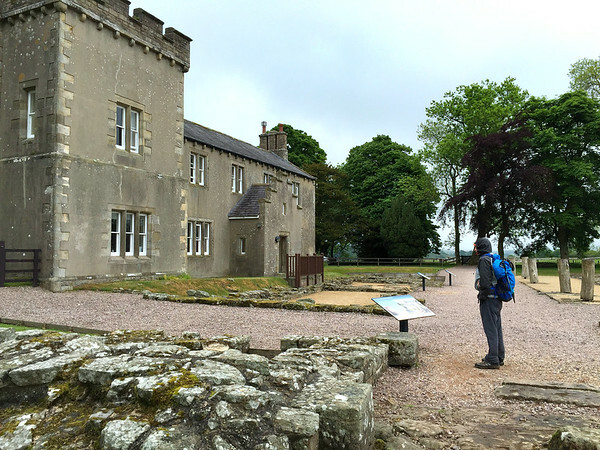 The Hadrian’s Wall National Trail itself was fantastic, with a great variety of landscapes as well as the famous wall and Roman forts. It was a pleasure to get to know the area up close, walking through the many farms, villages or wilderness areas. There are more attractions than we had time for along the way, including Roman forts, and also churches, museums, and villages. The National Trail website: They have a map that was a great help in finding accommodations along the wall. Hadrian’s Wall Path guidebook, by Gordon Simm and Jacquetta Megarry, helped in planning the trip, and kept us on track during the walk. 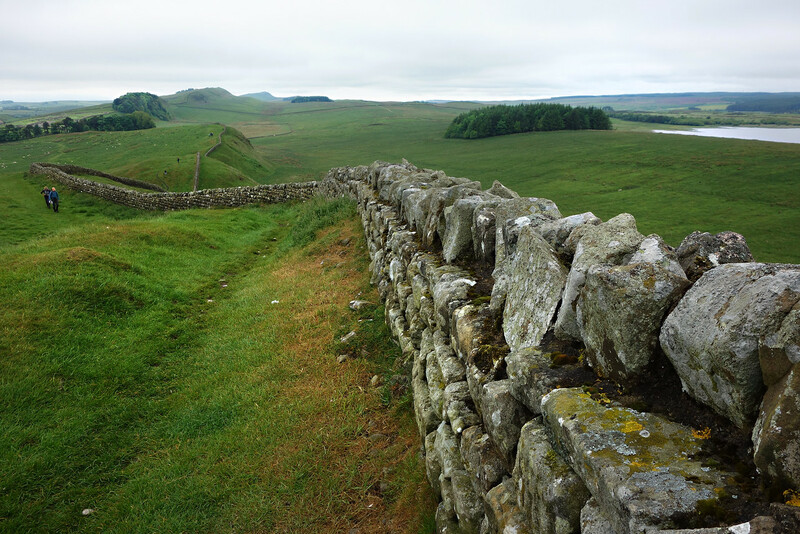 Check these links for more resources and tips for planning your own Hadrian’s Wall walk, and our gear list. Disclosure: This page contains affiliate links to products we recommend and have verified and/or personally used, and at no additional cost to you, we may earn a small commission if you make a purchase. 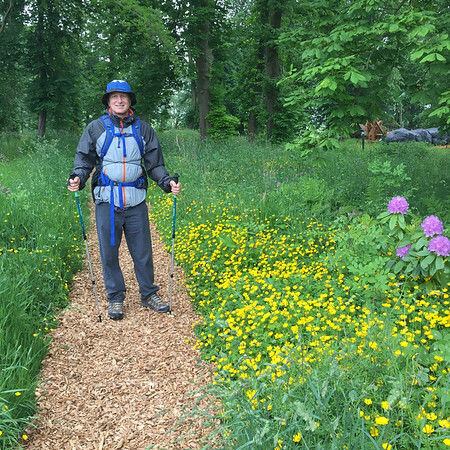 Eight Walks in the "Wild"
Shelley thank you so much for your daily diary of your trip. My friend and I are planning to do 4-5 days and we only want to walk about 16km a day. We plan to spend a day in one or two towns. Are there any particular towns you feel we should not miss? Any advice on planning a shorter trip would be greatly appreciated. Hi Debbie. If we had to cut back our trip, we would probably leave off the last two days. While Newcastle itself was enjoyable, the walk in and out of the city is less interesting and a lot of it along busy highway. If you started your walk at Halton Red House, then walked west to Carlisle (or reverse). The path west of Carlisle is a very pleasant walk, although you don’t see Hadrian’s Wall in this section. 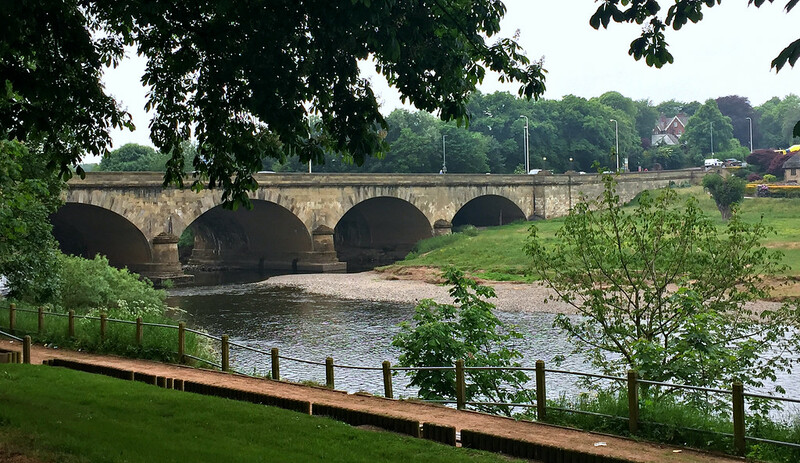 There is plenty to see in Carlisle, but we didn’t really get to know the other towns – we just popped in to interesting churches or pubs or cafes we saw along the way. Depending on your fitness 16km/day is an easy amount for the coastal sections, but a little more challenging for the middle section around Housesteads Roman Fort. You’ll also have to plan your distances according to where you can book accommodation. Have a great trip! Really enjoyed your travelogue. My husband and I are doing this trek this July, also west to east, but taking almost twice as long as you. We like to bird and ramble and don’t want to rush. I’m trying to figure out how to pack our hiking poles. Any suggestions? It will be great to have more time as there a lot of interesting spots along the way. If you have collapsible poles like we do they fit into our suitcase, and during the hike our backpacks had a spot to attach them on the outside when they weren’t being used. I’m sure you’ll have a wonderful trip! What an adventure! Thanks for the photos and tips. I’d love to do this walk. Oh those blisters! It looks like you were a tough walker on the Hadrians Wall Walk. Those are some big distances to cover. so lush and green! I’d like a do-over for Hadrian’s Wall. Nice post! 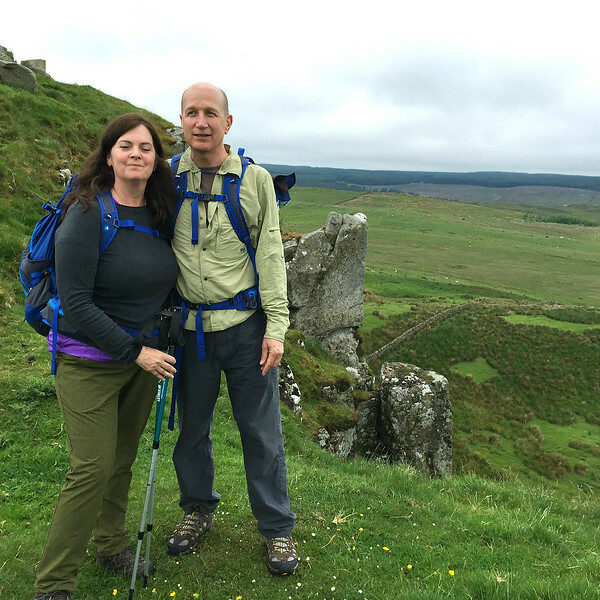 We’ve walked the Camino, but really foul weather–big winds and downpours–limited our Hadrian’s Wall experience. We ended up hiring a car and spending our time at the forts. Did you have all your accommodations booked in advance? What resources did you use to book your B&Bs? Anyway, this does take more advance planning in many ways than the Camino, where you can walk as long as you like and always find a place to sleep. Great questions Kristin. We did have all our accommodations booked in advance, which I think is essential for this walk due to limited availability. The National trails website was our main resource for the smaller B&B’s along the wall (http://www.nationaltrail.co.uk/hadrians-wall-path/plan). Some of these B&B’s aren’t on the usual search engines. 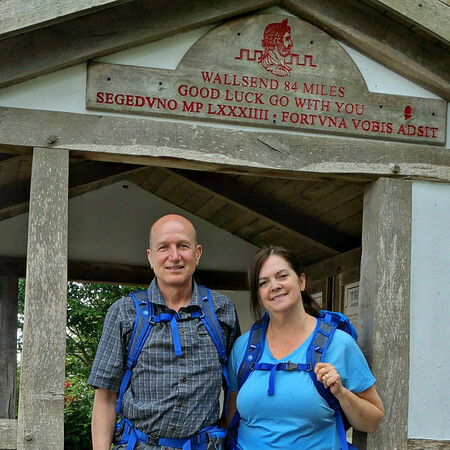 That’s awesome you walked the Camino – it’s still on my list for someday! Lucky for us the rain on our Hadrian’s Wall walk was more of a drizzle without the strong winds. Thank you Marcelle, it is a wonderful region. We loved those quaint pubs that fit so well into the country landscape, with their cozy atmosphere and delicious food. What a grand walk you had! I visited Hadrian’s Wall many years ago, traveling from castle to castle, researching a book on castles. That was when I first heard about the wall. 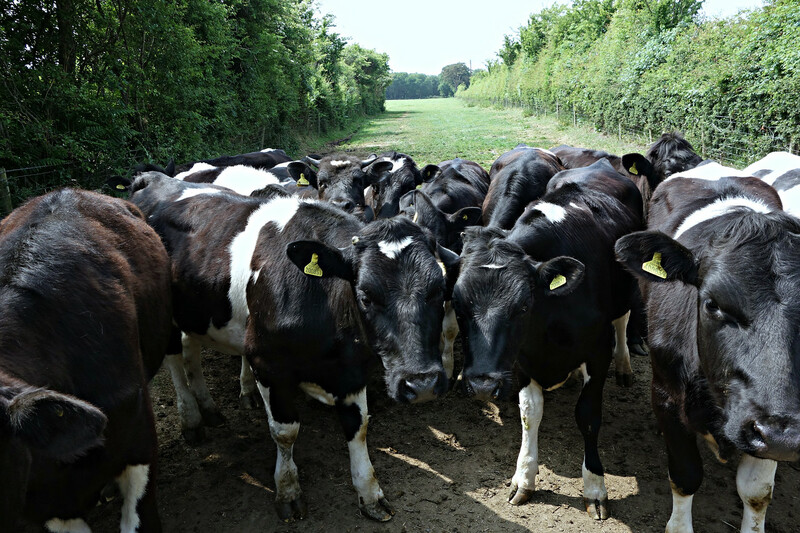 LOVE those cows. Thanks Carole! Researching castles must have been a fascinating project! Congratulations on completing the journey! It was really fascinating and the scenery was beautiful. I liked what you did so much I think I’d like to do it too! That was so cool about the “famous Stall-on-the-Wall” with food. Love the generosity of hikers! Your blisters sounded awful, but good ol’ duct tape does the job! I’m book marking this post for one of my future trips! Thanks so much for sharing a really neat adventure. By the way, the first photo is super! Thanks Janice! After this first long walk I would love to do another, and England has such a great national trail network. But there are so many other places to explore! I was just reading about the Wall in a Nat Geo but didn’t know about the walk. Looks like a helluva journey, even in 6 days! Kudos to you. Thank you 🙂 If I can do it anyone can do it! It is a pretty unique trail, to walk alongside a UNESCO site. Absolutely magnificent. 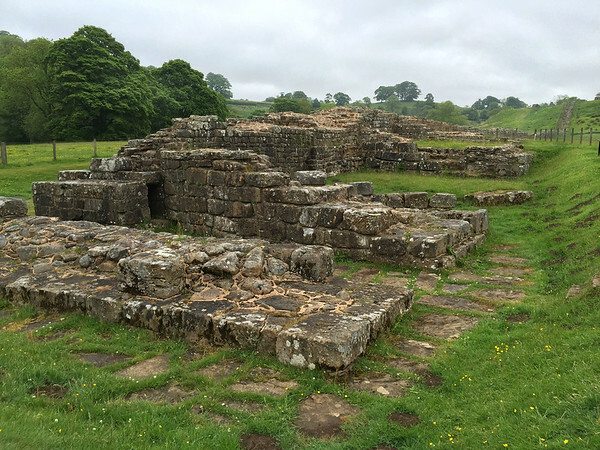 I had a whirlwind visit to Northern England in March, with about 30 minutes to see Hadrian’s Wall. I imagined it would be a fun trip to explore the entire length and you did it! Thanks Charles, it was great to explore the length of the wall. I wish we had more time to explore the Roman sites along the way. There’s always next time! 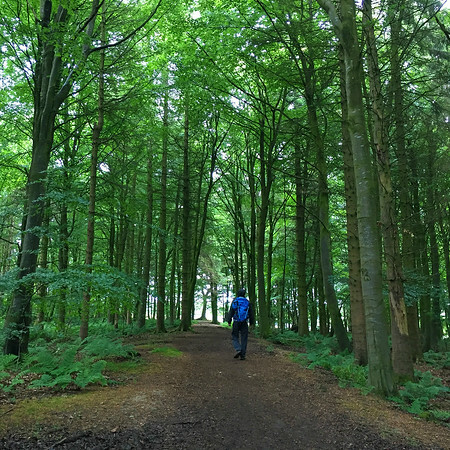 You’re photos and description have me quite excited about trying this walk for myself and I’ll use your excellent tips and resources as I start researching this. 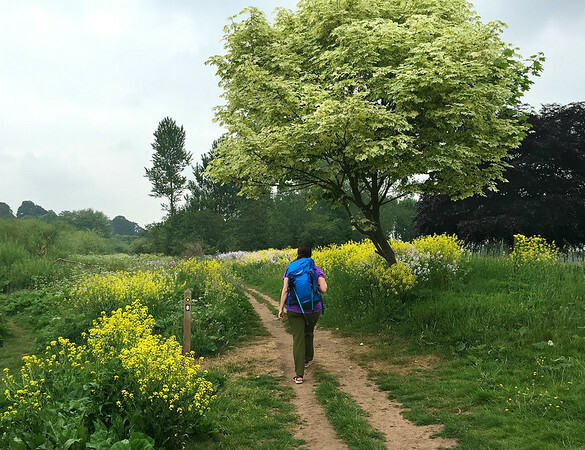 Lovely photos that confirm what a gorgeous country England is and how entertaining it would be to learn about the history and countryside through a long walk! Thanks for sharing! It’s true the English countryside is so green and peaceful. It was a real pleasure to walk through and see the farms and villages up close. I walked the Hadrian’s Wall Path last year (in the opposite direction). 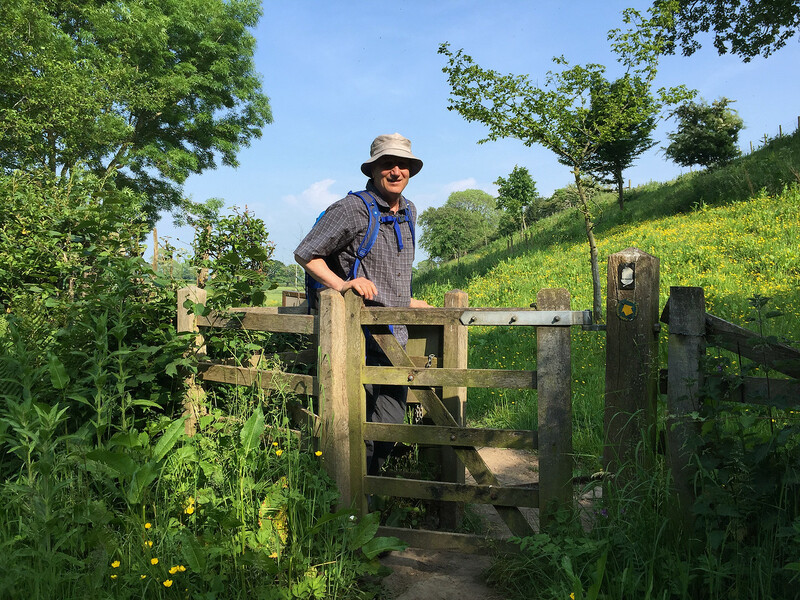 It was the hottest week of the year which made the walking harder but it was worth it for the beauty of the countryside. Thanks for the reminder of a great walk. We only had one hot day, and while I loved the blue skies it was easier to walk on the cool days. Glad to hear you enjoyed the walk too! Thanks for taking us along on your walk, even the blisters. The most we’ve tried was a 36 mile hike in New Zealand, so you went a lot farther. I remember seeing a glimpse of Hadrian’s Wall crossing into Scotland in our family station wagon back in 1970. I was happy to see that your photos confirm the intense green I remembered. I’m sharing a copy of this with Mr. Excitement to see if I can entice him into giving this a try. It is so green! I hope you can convince Mr. Excitement to try the walk. 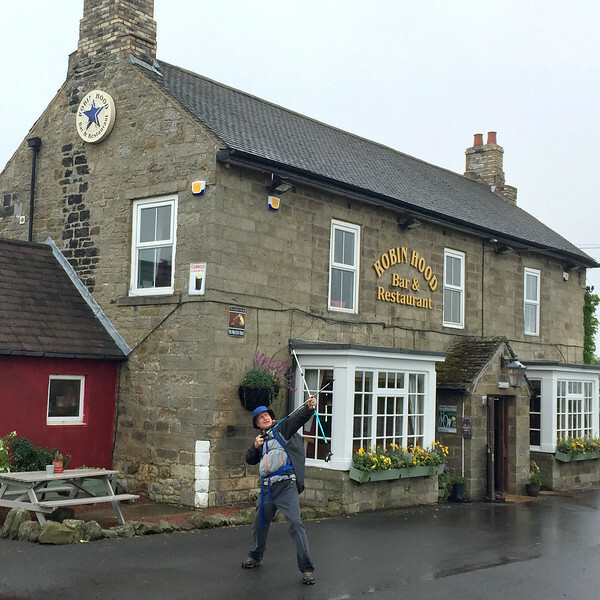 The walking poles are fun to use, and at the end of each day there’s a guilt-free meal and a pint at a cozy pub!